Efficient, non-toxic processing heating system. Very low flow resistance in the vertical evaporator pipes to guarantee high water circulating rates. No refractory matirial in the combustion chamber, thus preventing heat storage and uncontrolled evaporation in the event of an emergency shutdown. Bursting disc and safety valve as the system protection against overpressure and vacuum. We are a renowned organization, which is engaged in offering High Pressure Natural Circulation Steam Boiler to our clients. 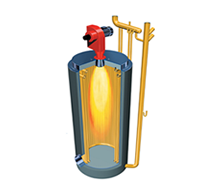 The offered range of High Pressure Natural Circulation Steam Boiler is designed utilizing high grade raw material and modern techniques in conformation with the highest quality norms and standards. This range is applicable in different areas such as industries, hospitals, hostels, residences and hotels.